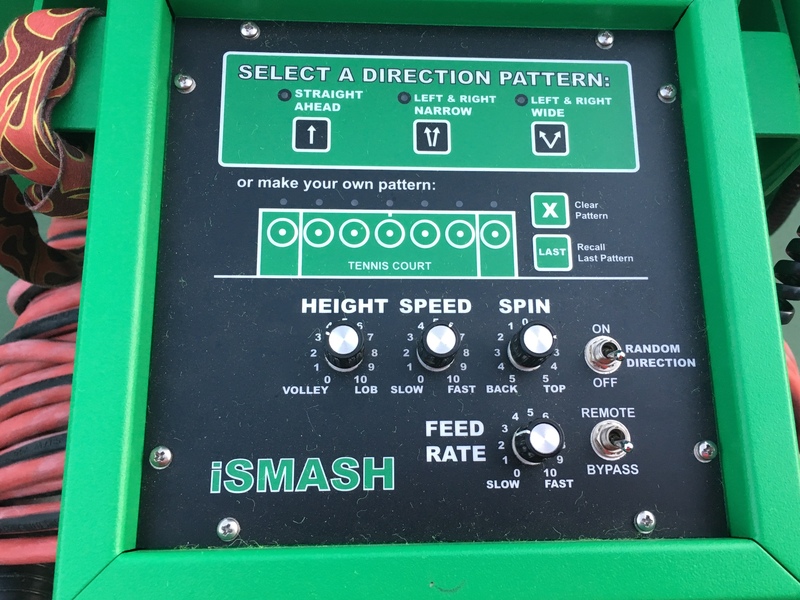 Orindawoods has a Playmate Smash Ball Machine. The Ball Machine is stored in the ball shed next to courts 2 & 3. The ball machine is not to be used during rain, drizzle or any time the court is wet. See below for operating instructions. The Ball Machine may be rented by each single individual use, or you may join the Ball Machine Club for a year. Ball Machine Club: $110 for a year of unlimited use, when the machine is available. With the Ball Machine Club membership, you get a key to the ball shed. The full year starts March 1 and goes through February 28. We start prorating the Club price in July. 1) Ball Machine rental is for one hour time blocks. 2) The Ball Machine may be used before 9:00 a.m. and after 10:30 a.m. to 6 p.m., weekdays. 12 noon to 6 p.m. on the weekends. 3) Generally, the ball machine can't be used during Prime time, 8:30-10:30 a.m. (12 noon on the weekends), and on the lighted courts at night (if the 7:30 pm or later time seems available later today, you can use the ball machine then -- just no advanced night-time reservations). 4) The Ball Machine is usually used on Court 3, when it is not in use. Court 2 can be used if there are no lessons scheduled, but our Pros have priority on both courts. 5) To reserve the Ball Machine, go to the "Court Scheduler" at the top of the page, find the date you want to reserve, and pick the time. When you reserve court 3, you are also reserving the ball machine. 6) You can also reserve the machine by calling the Pro Shop (254-1065). 7) The ball machine is not to be used during rain, drizzle or any time the court is wet. Power: This switch controls the power to the machine. When it is illuminated, power is being supplied. The Power switch is located on the ball machine cabinet on the side. 1. Feed Rate -- This knob determines how frequently the balls are pitched. Turning the knob clockwise increases the number of balls pitched to a maximum of approximately one ball per second. Turning the knob counterclockwise decreases the number of balls per minute. 2. Speed -- This knob sets the speed at which the ball is thrown. Turning this knob clockwise will increase the overall delivery speed of the ball. Turning it counterclockwise will decreases the overall speed. 3. Height -- This knob controls the overall height of the ball being pitched. Turning this knob clockwise increases the height of the ball. Turning it counterclockwise decreases it. 4. Direction -- The direction patern gives you the choice of straight ahead, left and right narrow, and left and right wide. Or you can make your own pattern. To set a pattern of shots, push each button for where you would like the shot to go, and in the order you wish. You have a couple of seconds for each shot selection before the pattern sets. 5. Spin -- This knob controls both TOP and BACKSPIN of the ball being thrown. Turning this knob clockwise will give TOPSPIN, counterclockwise BACKSPIN, if this knob is at 12:00 o'clock it will be a flat ball. 6. Remote -- This machine is equipped with a radio remote control system. By selecting the REMOTE position toggle switch, the hand held remote becomes activated. By selecting the BYPASS position of the REMOTE toggle switch, the hand held remote becomes deactivated. 7. App. On the iPhone there is an App available, Like My Drill, which allows you to use your iPhone as the remote. It includes several drills, and the ability to make your own. Check with the staff for more details. Safety Precaution: It the machine is turned ON and the REMOTE switch is on the BYPASS position the machine will begin to throw balls.